QUESNEL, British Columbia, Canada, August 8, 2014 (ENS) – A tailings pond breach at the Mount Polley copper and gold mine in south-central British Columbia early Monday has released 10 million cubic meters of contaminated effluent into two lakes and local rivers and creeks. Officials with the BC Ministry of Energy and Mines say this is the largest tailings spill in at least the last 40 years. 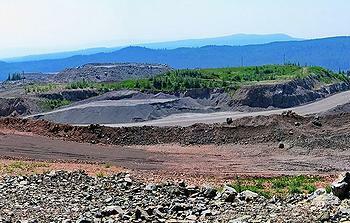 The province Tuesday issued a pollution abatement order to the Mount Polley Mining Corp., owned by Imperial Metals. The first item of business is for the company to stop the flow from the tailings impoundment breach. As of Thursday the flow of tailings from the breach was still ongoing. It “has decreased dramatically but has not completely stopped,” said the BC Environment Ministry. The mine is located in BC’s Cariboo region, 30 km (20 miles) from the gold rush town of Likely, population 350, on the shore of Quesnel Lake. The mine tailings flowed first into Hazeltine Creek, originally a four-foot-wide stream that is now 150 feet wide. The tailings fouled Polley Lake and Quesnel Lake, the deepest fjord type lake in North America situated in the world’s only inland temperate rainforest. The area is one of the province’s most important salmon breeding grounds, and upstream of the Fraser River, scene of the West Coast’s largest salmon runs. The Cariboo Regional District has declared a State of Emergency and issued a water ban advisory. People are warned not to drink or bathe in the water and not to allow pets or livestock to drink it. Waterways affected by the ban include Quesnel Lake, Polley Lake, Hazeltine Creek and Cariboo Creek, as well as the Quesnel and Cariboo Rivers systems up to the Fraser River. The ban does not apply to people in Williams Lake or other towns along the Fraser River. No injuries have been reported. Save-On-Foods and the Canadian Red Cross have donated nearly 20,000 bottles of water, distributed to Likely residents Thursday. The company was encouraged by the results of provincial water quality testing in Quesnel Lake and the Quesnel River. The test results, issued Thursday, showed the water samples met both provincial and federal safe drinking water guidelines. The BC Ministry of Environment stated Thursday that “impact to aquatic life and fish is not expected,” and a spokesperson said crews have not found any dead fish in Quesnel Lake. But Sierra Club BC is calling on the British Columbia government to establish a committee of experts, independent from industry and government, to investigate the Mount Polley disaster. The committee should identify the necessary steps to prevent future tailing pond catastrophes in mines across the province, making their initial findings public within six months and producing a final report within one year. 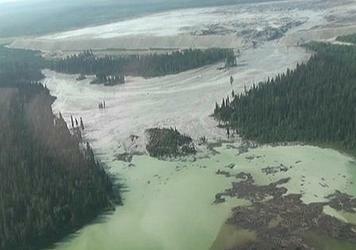 Imperial Metals had been warned of potential disaster at the Mount Polley mine before this week’s breach. The ministry most recently warned the company in May, for exceeding the permitted height of wastewater within the tailings pond. According to the ministry, the wastewater level returned to normal in June. Previous warnings for various violations were issued in April 2014, August, April and January 2012. Contaminants in mine wastewater are regulated under the general British Columbia Water Quality Guidelines, yet companies are permitted to develop site-specific standards. At times over the past few years, the Polley Mine has exceeded guidelines for nitrate, cadmium, copper, iron and selenium, sulphate, molybdenum, and organic carbon concentrations, the CBC reports. Debris in Quesnel Lake is being cleared and contained. The log boom boats and crews commissioned by the company have secured the timber that was swept into the lake and are now gathering lighter debris. The company submitted a preliminary Environmental Impact Assessment and Action Plan to the provincial government has begun working with regulators to implement the plan. Imperial Metals held a community meeting today in Likely to inform the community of actions taken and plans to stabilize the mine site. Environmentalists are warning that Imperial Metals could be permitted to mine in Vancouver Island’s fragile Clayoquot Sound. The David Suzuki Foundation, headed by the famous broadcaster and scientist, warns that BC’s mining industry is expanding quickly. “Two new mines are expected to start production this year, five more projects are permitted or under construction, seven expansions are approved and 20 more mines and expansions are moving through the environmental assessment process,” the group said this week. “With timelines reduced and processes streamlined for environmental assessments to fast track new mine approvals, we can expect more of these kinds of devastating events,” the Foundation warned. Suzuki and other environmentalists are asking the BC government to implement immediate, province-wide mandatory inspections of all tailings ponds with assessed high-risk structures and delay approval of new mines until tailings management plans utilize best available technologies.